In 2015 Cork achieved a UNESCO award as a Learning City, one of three cities in Europe and one of twelve cities worldwide. Following from this, a Learning Neighbourhoods programme was piloted in Cork City in collaboration with UCC, Cork City Council and Cork education & training board. Learning Neighbourhoods works with education & community organisations and residents to promote and develop active local lifelong Learning with an emphasis on social inclusion. 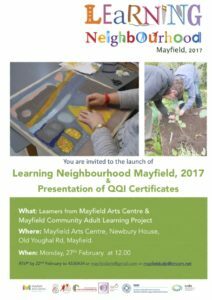 Mayfield has been chosen as a Learning neighbourhood in 2017. 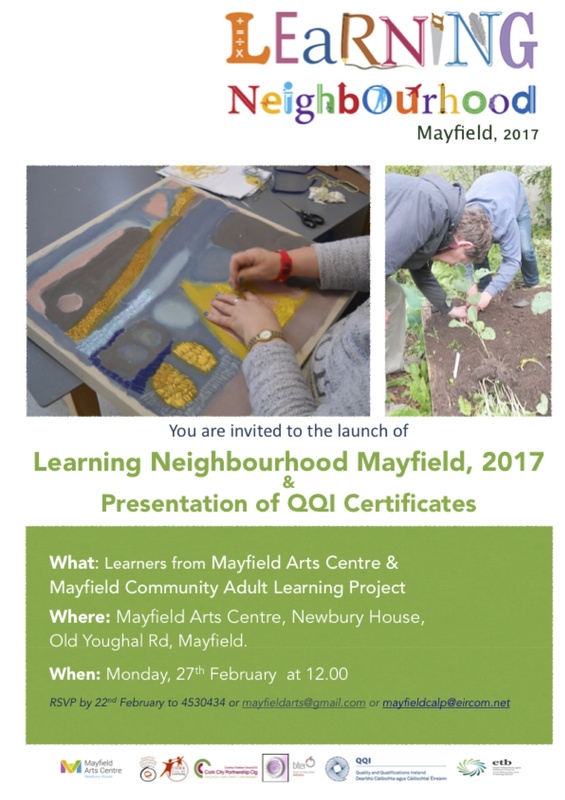 On Mon Feb 27th at 12.00, Mayfield Arts Centre will host the launch of Learning Neighbourhoods 2017which will also include a QQI certificate awards ceremony for local learners from Mayfield Arts and Mayfield Community Adult Learning project. The event will be launched by the Lord Mayor Cllr Des Cahill, there will be an exhibition of art work, pop up cafe and lots more.